Would be great to see how this progresses, Yahoo! Mail has tried this out with it’s “Applications” but I’m unsure of how successful those are but interesting none-the-less. Seeing all the attachments sent to you would be useful especially when dealing with documents. Though the biggest improvement would be to fix email overload. I agree, Gmail is a platform that can and is being extended. About a year ago we through in a new Gmail feature to a newsletter curation app called flashissue. It really took off. Many of our small business users starting telling us that they would rather stay in Gmail when it comes to creating a newsletter – as opposed to signing up for another service. like Mailchimp. They want to be able to email market to people in their address book – they dont have an external list. We’re getting ready to add a set of features to Gmail, that will help this whole process: a better newsletter editor, list builder (with unsubcribe etc) and campaign analytics. 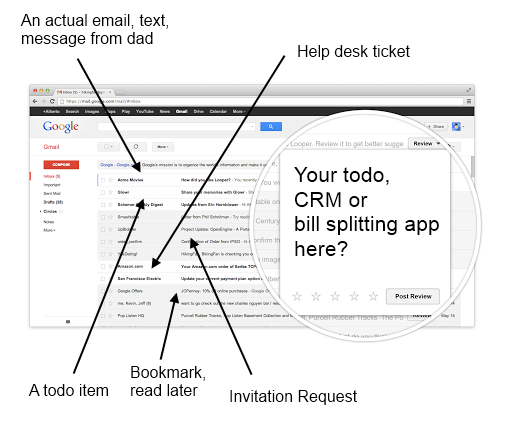 Think, all the features you get in Mailchimp but now inside Gmail. Anyone with thoughts / feedback would be useful. Take a look at http://flashissue.com/for-gmail . This reminded me of ActiveInbox http://www.activeinboxhq.com/index.php . It’s not the same as an action list, but it might help with overload. I just had a thought today about improving email and I’ve no idea if this development could help. I often have to search gmail for a specific topic or info nugget. I then would *love* to compile selected emails into a custom list or “Case” and be able to add notes around them. And perhaps scrawled annotations via the mobile app. On top of that add auto-filtering of email to Cases. At the moment I tag related emails but it provides a less than satisfactory experience. Then again it would be awesome if emails could be embedded into Papyrs somehow.